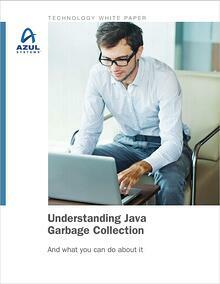 Written for IT professionals, architects and developers, this white paper reviews and classifies the various garbage collectors and collection techniques available in JVMs today. It provides an overview of common garbage collection techniques and algorithms, and defines terms and metrics common to all collectors including generational, parallel, stop-the-world, incremental, concurrent, and mostly-concurrent. It further classifies each major JVM collector’s mechanisms and characteristics and discusses the tradeoffs involved in balancing requirements for responsiveness, throughput, space, and available memory across varying scale levels. The paper concludes with some pitfalls, common misconceptions, and “myths” around garbage collection behavior, as well as examples of how certain choices can result in impressive application behavior..